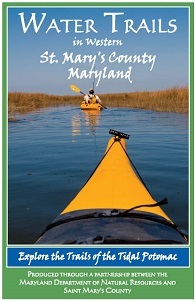 In partnership with St. Mary’s County, the Town of Leonardtown, and a committee of local paddling enthusiasts, Maryland DNR coordinated the development of a series of water trails along the western side of the St. Mary's peninsula. This guide has individual maps and detailed information on access sites and paddling routes along the Lower Potomac, Wicomico and St. Mary’s Rivers as well as McIntosh Run, Herring Creek, and Smith and Jutland creeks. The guide also features historic, cultural and tourist resources.